I woke up this morning to find the search engine, Google, in morse code. What a great way to commemorate Samuel Morse’s birthday. _ _. _.._ google! 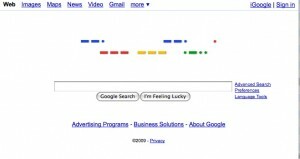 This entry was posted in News and tagged CW, Google, Google Doodle, Morse Coe, Samuel Morse. Bookmark the permalink.